of Germany and resistance to the Nazi regime. Arrested by the Gestapo in 1943, Bonhoeffer was killed along with his brother and other conspirators. A brief but helpful summary of Bonhoeffer’s work against the Nazis can be found at the Holocaust Museum website. Rather, according to Bonhoeffer, the church may critique the state as either creating too much or too little law to fulfill the governmental function. The church may rightly complain if the state uses “force to such a degree as to rob the Christian faith of its right to proclaim its message.” On the other hand, if the state doesn’t create enough law and as a result a group is deprived of rights, the church may also speak. “There is too little law and order wherever a group of people are deprived of its rights,” he wrote. In such cases, there are three actions which the church may take. First, (as we have said) questioning the state as to the legitimate state character of its actions, that is, making the state responsible for what it does. Second is service to victims of the state’s action. The church has an unconditional obligation toward the victims of any societal order, even if they do not belong to the Christian community…The third possibility is not just to bind up the wounds of the victims beneath the wheel but to seize the wheel itself. Such an action would be direct political action by the church itself. At the other extreme from too little law and order, there can be too much law and order. This would mean the state developing its use of force to such a degree as to rob the Christian faith of its right to proclaim its message. (This does not apply to restriction of free conscience — that would be the humanitarian version, which is an illusion, since every state in its life impinges on the so-called free conscience). As a possible case in point, I have a sense that Bonhoeffer would reject the state making pastors officiate at gay weddings, but he might not have a problem with anti-discrimination laws regarding Christians providing services in the marketplace. Bonhoeffer’s essay provides a useful foundation for considering how Christians today could consider religious liberty and church and state relationships. In his day, he chose to intervene because there was too much law. My reaction is that many religious liberty issues which occupy Christians politically today don’t rise to the level of “too much law” as framed by Bonhoeffer. I would like to see the church spend more time and money on fulfilling Bonhoeffer’s second point. As for his third point, in America, in my opinion the essential Christian message is in no danger of government restriction. Eric Metaxas lives in a curious space among those who admire and study German pastor and martyr Dietrich Bonhoeffer. In one universe dominated by evangelicals outside of academia, Metaxas is viewed as a Bonhoeffer scholar. In another dominated by academics and Bonhoeffer scholars, he is considered to be a Bonhoeffer revisionist, someone who has hijacked Bonhoeffer perhaps for partisan religious purposes. There are a number of liberal critics of my book. I keep seeing stuff on the Internet and they’re very vicious and they act as though I threw something together over a weekend to suit my view of the world, you know, wrapped in the life of Bonhoeffer and I just want to use this opportunity, since I am not typically talking about my book on Bonhoeffer. Anybody who is a historian on any level whether professionally, academically, or more as an amateur as I am, you know you want to take facts very seriously. And I do want to say that there’s not a syllable in my Bonhoeffer book that isn’t true and I think that people who don’t like how Bonhoeffer comes out in my book, that’s really something that reveals where they’re coming from more than where Bonhoeffer or I are coming from because his is such a well documented life. Metaxas also does not have a solid grasp on Bonhoeffer’s historical context. It is hard to give much credence to someone writing about German history who thinks that Bonn is in Switzerland or that Hitler was democratically elected into office or that Germany was not yet a police state in August 1934. Metaxas also claims that the Barmen Declaration, which was the doctrinal statement of the Confessing Church, rejected anti-Semitism. In reality, the Barmen Declaration does not mention anti-Semitism at all, and many scholars have criticized it for this. Remember Weikart is not a liberal. To fact check the claim about the Barmen Declaration, all one has to do is read the declaration (source) and compare it to what Metaxas wrote about it in the Bonhoeffer bio on page 222. On the last three days of May 1934, the leaders of the Pastors’ Emergency League held a synod in Barmen. It was there, on the Wupper River, that they wrote the famous Barmen Declaration, from which emerged what came to be known as the Confessing Church. As Weikart said, the Barmen Declaration doesn’t address anti-Semitism. Metaxas said the document repudiated it. Two other Bonhoeffer scholars have written critical reviews which point out some of the book’s errors. I don’t know the political views of Victoria Barnett or Clifford Green but I do know they know their Bonhoeffer. They point out many syllables which should be examined (See Barnett’s review here, and Green’s here). Even though I am confident in my work, I cannot imagine claiming that it is flawless or infallible. In fact, people who claim such perfection should arouse our skepticism. Rather than bask in the glow of his guest’s flattery, I hold out hope that Metaxas might eventually take a more reasonable and scholarly approach. Later in the broadcast, Dr. Arnn suggested that Metaxas consider college teaching. I do not second that motion. One must be prepared to accept peer review and critical reflection in order to do so. Apparently, Metaxas believes he has no need of such refinement. *This is not the first time Metaxas has minimized his factual errors. See his response to significant problems with the historical accounts in his new book, If You Can Keep It (link, link). See also this new review at Christ and Pop Culture. Eric Metaxas, who wrote a biography about Wilberforce, retweeted the quote without comment so surely it was said by Wilberforce, right? I view most quotes now with suspicion (see this quote misattributed to Bonhoeffer) and this one looked fishy. Indeed, it isn’t by Wilberforce but about him. I posted the quote on Twitter and asked for assistance tracking it down. It didn’t take long for Matthew Dickson to post a link to an Introduction written by Chuck Colson to a 1996 reprinting of Wilberforce’s A Practical View of Christianity. 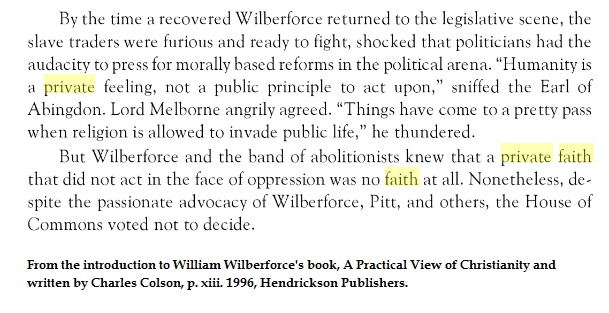 On Twitter at least the switch of attribution from Colson to Wilberforce took place sometime between 2011 and 2012. So Colson wrote it about Wilberforce. Even though it is frequently attributed to Wilberforce, it isn’t his quote. As I have explored these fake or misattributed quotes, I have found that a major problem to accuracy is a site called “AZ Quotes.” This site is often referred to by misguided quoters. Along with Eric Metaxas, AZ quotes seems to show up frequently as a source for the misattributed quote about silence in the face of evil. Although I have reported both quotes as being wrongly attributed, the quotes remain. Perhaps, the site needs to hear from more readers. The quote cannot be found in Bonhoeffer’s writings and no other primary source has been found. The first appearance of the entire quote I can find is in a 1998 American Interfaith Institute newsletter. 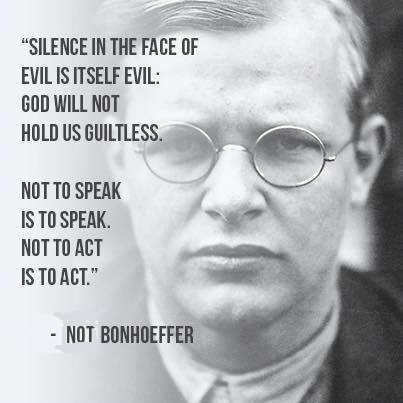 The quote has been popularized by Eric Metaxas who still attributes the quote to Bonhoeffer even though he has refused to provide a primary source for it. Today, I want to present a source for part of the quote which is earlier than 1998. In Robert K. Hudnut’s 1971 book, A Sensitive Man and the Christ, he makes a case that even a sensitive man must act when the need arises. There are two aspects of this passage which may link it to the eventual misattribution to Bonhoeffer. One is Hudnut’s challenge for the church not to be silent in the face of social evils. The second is the reference to Niemoller and resistance to the Nazis. 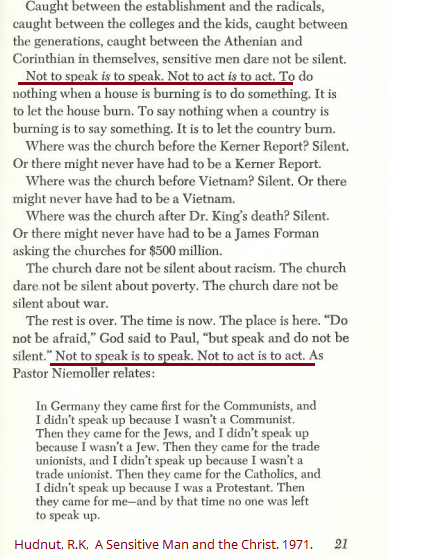 Through the frailty of memory and lack of citation, someone could have reworked this into a quote about the church not being silent and attributed it to Niemoller’s colleague, Dietrich Bonhoeffer. For “God will not hold us guiltless,” one can find many references to that sentence by going to Google books and entering the sentence in quotes. The links returned go back to 1681. The Hudnut quote was pointed out to me by a Twitter user. I would like to thank him but I can’t find the tweet. If my helper is reading, please identify yourself in the comments. Hillary misquoting Tocqueville is like Reagan misquoting Marx. Hillary said in passing that “America is great because America is good.” Although the quote is commonly associated with Tocqueville, it can’t be found in his works. During the debate, Clinton did not attribute the quote to Tocqueville. However, Metaxas himself attributed that quote to Tocqueville in an advance copy of his new book If You Can Keep It. The attribution of the quote was corrected before publication. 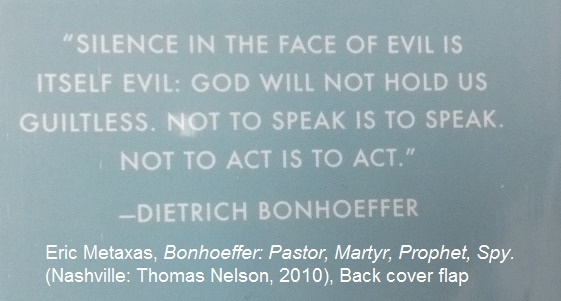 This quote is attributed to Bonhoeffer on the back flap of Metaxas’ biography of the German pastor. He also has referred to it in his speeches and tweets as well as his book on Miracles and a study edition of the Bonhoeffer bio. However, it cannot be found in Bonhoeffer’s works. I have contacted Metaxas and publisher Thomas Nelson but have yet to receive the courtesy of a reply. There is no disgrace in getting a quote wrong. Scholars do it frequently. The mark of a scholar is to correct the record quickly. To me, this seems especially important since Metaxas has lately taken to advancing Bonhoeffer in the cause of presidential politics. Despite our differences, I urge Metaxas to do the right thing and either provide his primary source for the quote or acknowledge the quote doesn’t come from Bonhoeffer. A vote for Donald Trump is not necessarily a vote for Donald Trump himself. It is a vote for those who will be affected by the results of this election. Not to vote is to vote. God will not hold us guiltless. This paraphrase — “Not to vote is to vote. God will not hold us guiltless” — of a quote Metaxas has incorrectly attributed to Dietrich Bonhoeffer reminded me that Metaxas and publisher Thomas Nelson have not answered several requests going back to early August to provide a citation or correct their attribution for the quote. 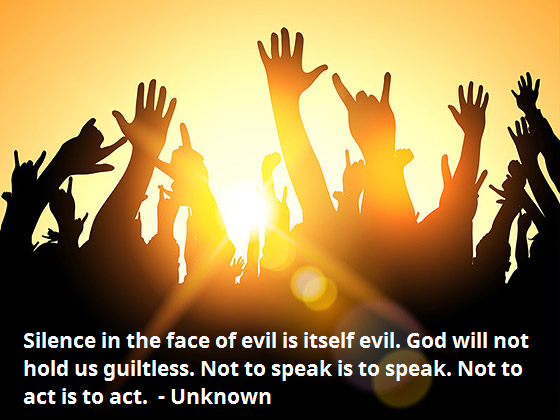 The popular quote — Silence in the face of evil is itself evil. God will not hold us guiltless. Not to speak is to speak. 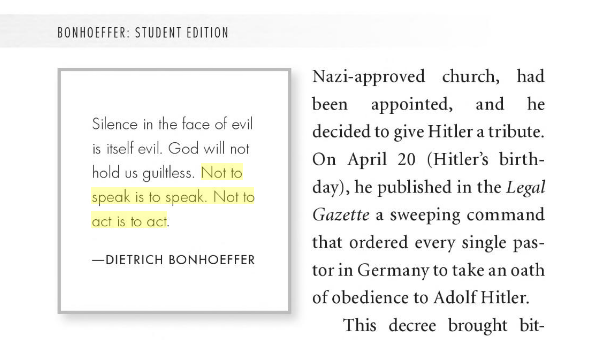 Not to act is to act — was attributed to Bonhoeffer on the back flap of Metaxas’ biography of the German pastor published in 2010 but cannot be found in any of Bonhoeffer’s works. Since then Metaxas has included the quote in some of his Bonhoeffer resources and attributed it to Bonhoeffer in various public appearances. Early on in my research of this quote, I contacted Metaxas via Twitter and his website to ask for a citation. He did not respond. I also asked a couple of mutual friends to ask Metaxas about the source of the quote. There was no response given to these people. I wrote publisher Thomas Nelson three times with no response. Given ethical principles in publishing, I believed that Metaxas and Thomas Nelson would either provide a source or issue a correction. However, that has not happened. I think the last three principles are relevant to this situation. Even though the quote is a good one, it can’t be found in Bonhoeffer’s works. The integrity of the academic record is involved. Even though it might be better for business if a perception of perfection is offered to the public, publishers and authors should “always be willing to publish corrections, clarifications, retractions and apologies when needed.” Unless they can produce a citation from Bonhoeffer, a correction is needed. So after weeks of seeking a source (others have as well) or correction, I continue to look for an ethical response from Metaxas and his publisher. In his speech to the Values Voter Summit yesterday, Starnes misattributed this quote to German pastor and anti-Nazi dissident Dietrich Bonhoeffer. To paraphrase Dietrich Bonhoeffer – not to vote — is to vote. I believe this is a Bonhoeffer moment for ever Bible-believing Christian in America. We can no longer be silent. We are to be civil but not silent. We must roar like lions. The problem is these words cannot be found in Bonhoeffer’s works. The experts at the Bonhoeffer Society can’t find it in his writings, and no one who uses the quote (not even Bonhoeffer biographer Eric Metaxas) has been able to supply a source for it. I traced it back to a 1998 exhibit in Philadelphia’s Liberty Museum, but now the Museum staff cannot locate a source for the quote. There is no source for the quote in Bonhoeffer’s works and no evidence that he ever said it. As I have pointed out before, “not to vote is to vote” is nonsense. When someone doesn’t vote, nothing can be counted for either side. The only way not voting could be considered a vote is if the act of not voting is considered a statement of non-confidence in all candidates. Whatever not voting is, the phrase “not to vote is to vote” is not a paraphrase of Bonhoeffer. Use the quote if you must, but pundits should stop attributing it to Bonhoeffer. Commonly attributed to Dietrich Bonhoeffer, I traced the quote back to a now deceased researcher at the Liberty Museum in Philadelphia who added the quote to Bonhoeffer’s exhibit in the museum. 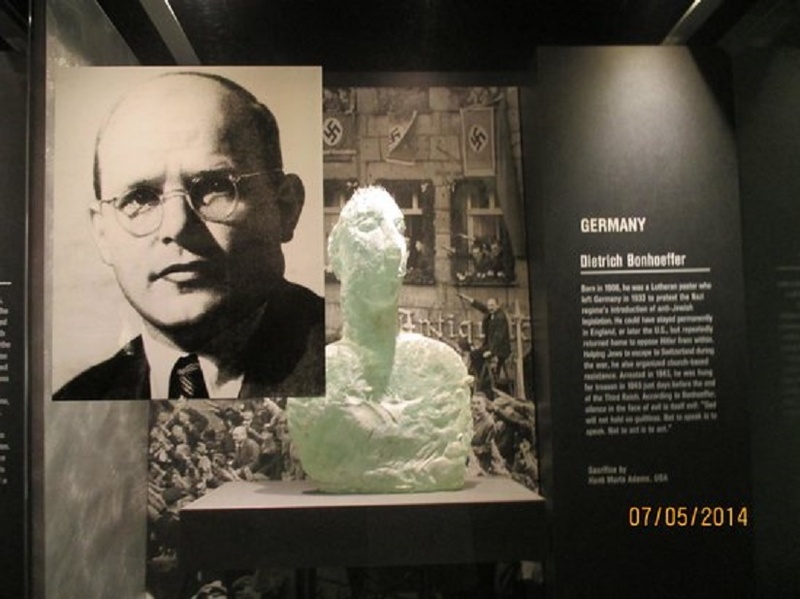 The current director of the museum did not know the source and the quote does not appear in any of Bonhoeffer’s writings according to the foremost expert on those writings, Victoria Barnett. 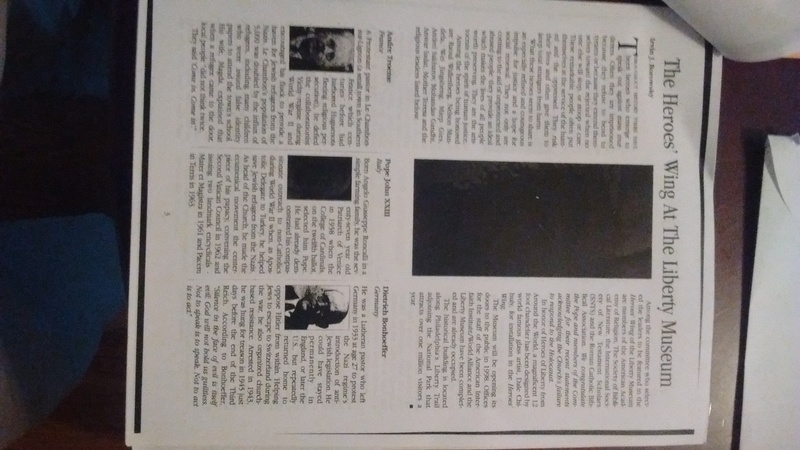 It cannot be found before a 1998 newsletter reporting on the opening of the Liberty Museum Bonhoeffer exhibit. Eric Metaxas, author of a biography on Bonhoeffer, has used the quote frequently attributed to Bonhoeffer but has not provided a source for the quote. International Justice Mission and several others have also made similar changes in the use of the quote. Thinking about this some more, I believe it is a good time to clear this up. So many people have enlisted Bonhoeffer through this quote for so many different and contradictory causes. Most recently, people for and against Donald Trump have tried to bring Bonhoeffer on their side. With Bonhoeffer’s aura and imprimatur, this quote is used frequently to make the justice of one’s cause seem self-evident. This is not a time for being so "heavenly-minded" we are no "earthly good." Not to act is to act. Not to vote is to vote. Please reconsider. I really doubt Bonhoeffer would have agreed with the perversion of the quote. Not to vote is not to vote. One cannot vote and not vote at the same time. How is the not voting vote to be counted? To illustrate the absurdity of just taking the form “not to ____ is to ____” and substituting one’s current cause or preoccupation, let’s take another recent blog topic: tithing. I really doubt Robert Morris would go along with “not to tithe is to tithe.” If one is hungry, it won’t fill your stomach to say, “not to eat is to eat.” Also, thinking about the silence from Metaxas on the attribution of this quote, I think it confuses things to say, “Not to take responsibility is to take responsibility,” right? Freeing the quote from Bonhoeffer invites us to consider that it might not be as wise and universally applicable as it first seemed. These are bold words and together they have helped strengthen the conclusion of many persuasive appeals. Though they are powerful, they are not from Bonhoeffer. According to my research and the Bonhoeffer scholars I consulted, these sentences can’t be found in any of his writings or speeches. This may come as a shock to countless (really, I stopped counting) Twitter and Facebook users who have posted a picture of Bonhoeffer with that quote attributed to him. The quote is on many lists of essential Bonhoeffer quotes (e.g., see Relevant Magazine’s list). Many politicians and authors have used it to make their many points. Although it wasn’t obvious to me at first, this was a joke based on “Not to speak is to speak. Not to act is to act.” Metaxas posted this in response to a Twitter user who described people who plan not to vote for Hillary Clinton or Donald Trump. At the time, his Twitter followers didn’t get the joke. Here are some of their tweets in response: “sounds like Bonhoeffer made a boo boo,” “Mr Bonhoeffer was right about many things but still a mere mortal!” and “Sorry, but I think the great Bonhoeffer whiffed on this one.” I couldn’t find anyone who questioned the authenticity of the modified quote. Like his Twitter followers, I also looked for the source of the “original fake quote.” In doing so, I learned something more interesting; the popular quote on which Metaxas’ joke was based (“Not to speak is to speak. Not to act is to act.”) had been incorrectly attributed to Bonhoeffer. 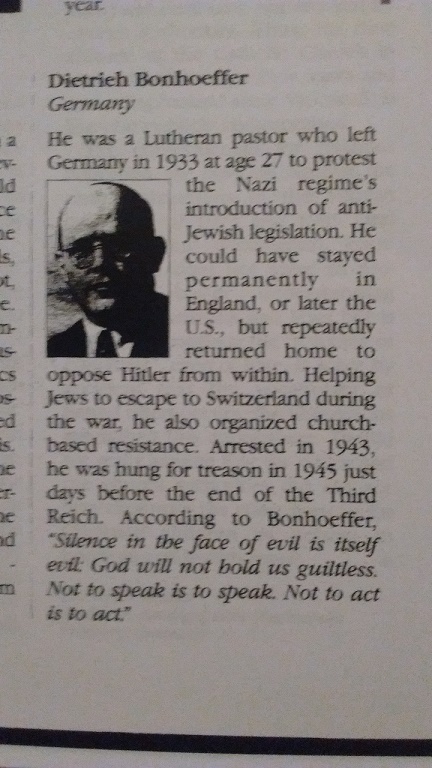 Many lists of “Bonhoeffer quotes” include a sharper indictment: “Silence in the face of evil is itself evil. God will not hold us guiltless. Not to speak is to speak. 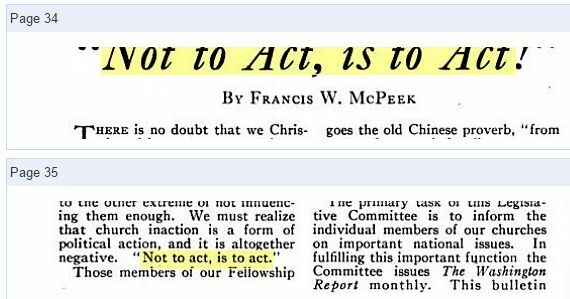 Not to act is to act.” See also Eric Metaxas, Bonhoeffer: Pastor, Martyr, Prophet, Spy. (Nashville: Thomas Nelson, 2010), back flap. However, this formulation has not been found in Bonhoeffer’s works. In a 2015 issue of the Australasian Journal of Bonhoeffer studies, Erich von Dietze also cast doubt on the quote. While commonly attributed to Bonhoeffer, the origin of this quote remains uncertain. The quote has been referenced to Metaxas, E. Bonhoeffer: Pastor, Martyr, Prophet, Spy – A Righteous Gentile vs the Third Reich. (Nashville: Thomas Nelson, 2010). However, I have not been able to find it in this work. The online resource Wikiquotes considers the quote to be “misattributed” to Bonhoeffer and names an obscure organization newsletter as the possible source. First attributed to Bonhoeffer in Explorations 12:1 (1998), p. 3, as referenced by James Cone (2004) Theology’s Great Sin: Silence in the Face of White Supremacy, Black Theology, 2:2, 139-152, footnote 1. Explorations was the newsletter of the now defunct American Interfaith Institute, founded by the late Irvin Borowsky. Borowsky also founded the Liberty Museum in Philadelphia. I located the newsletter via the online World Catalog and received a copy of the newsletter courtesy of the document delivery service at Grove City College. I have been in contact with Borowsky’s daughter Gwen who now manages the museum. Now that she knows the quote isn’t accurate, the exhibit will be changed when that gallery is remodeled (photo of current exhibit). She has no knowledge of the source of the quote since the researcher responsible for it has died. I cannot find it anywhere before 1998. After 1998, a few citations appear in various data bases but the most prominent is the one by Union Theological Seminary professor James Cone in his article “Theology’s Great Sin: Silence in the Face of White Supremacy” published in the journal Black Theology in 2004. Cone attributed the saying to Bonhoeffer and cited the Explorations newsletter as his source. By far, the greatest number of references to the quote have come after the publication of Eric Metaxas’ biography of Bonhoeffer in 2010. 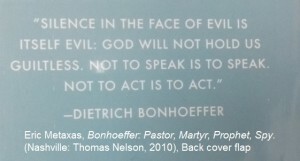 On the back flap of the book, the quote is attributed to Bonhoeffer. 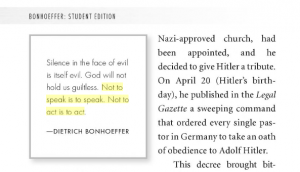 In his student guide and study guide for the Bonhoeffer book, Metaxas attributed the quote to Bonhoeffer. It also appears in his 2014 book Miracles. He has tweeted the quote attributed to Bonhoeffer in 2012 and 2013. Several other Christian books cite Metaxas as the source of the quote. I contacted Metaxas via his website and Twitter in early August to ask for his source. He did not respond. It has been used in hundreds of sermons and speeches opposing abortion and in support of religious liberty. A Google search returns over 38,000 instances of the quote. In April, Christian leaders opposed to Donald Trump used it to justify their opposition to his candidacy. Recently, Janet Porter used it to promote a vote for Trump. I’ve gotten a few inquiries on the source of that one, but it doesn’t appear anywhere in Bonhoeffer’s writings. I am virtually certain that the quote doesn’t exist. There can be little doubt that the quote’s popularity has risen with the success of Eric Metaxas’s Bonhoeffer biography. If Metaxas continues to use it in his speeches and his current website promoting the book, it may continue to be used inaccurately for some time to come. The appeal of this quote is understandable. The powerful arrangement of words elevates the importance of the cause and bringing Bonhoeffer to one’s side only strengthens the sense that the cause is just. However, since the quote isn’t his, using it is a false witness. In checking out this quote, I have learned to appreciate Bonhoeffer so much more than when he was just a figurehead on social media. There is value in fact checking. I didn’t find Bonhoeffer behind the quote, but what I found by reading his actual words is much more valuable. Note: I will add to this post if I find other information regarding the source of the quote pre-1998. UPDATE: On 11/11/16, I published an update to this post. In it, I provide an image of a 1971 book with “Not to speak is to speak. Not to act is to act.” used together. Did Hillary Clinton Plagiarize Alexis de Tocqueville? But here’s the sad truth: There is no other Donald Trump…This is it. And in the end, it comes down to what Donald Trump doesn’t get: that America is great – because America is good. These lines are uplifting and poetic. They are also spurious. Nowhere do they appear in Democracy in America, or anywhere else in Tocqueville. Read Pitney’s explanation at the Weekly Standard. Quick, Twitter’s going crazy over it. Now having established that, can we talk about Bonhoeffer author Eric Metaxas tweeting a spurious Bonhoeffer quote to promote Christians voting for Donald Trump? Author Warren ThrockmortonPosted on July 28, 2016 Categories plagiarism, politicsTags Alexis de Tocqueville, Dietrich Bonhoeffer, Eric Metaxas, Hillary ClintonLeave a comment on Did Hillary Clinton Plagiarize Alexis de Tocqueville?